I first saw this billboard outside of Manilla in the Philippines while traveling there in 2011. 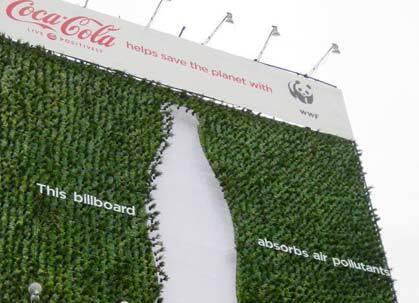 It caught my eye for three reasons: 1) it incorporates the billboard into the advertisement, 2) it advertises the product while also making an environmental statement for the company by potentially counteracting climate change, and 3) it will likely inspire a break through idea in someone to use billboards for additional, useful purposes (hanging gardens, solar panels etc.). Why does this matter? Sure, Don Draper makes some of us want to find our way to Madison Avenue to join an advertising firm (or run the other direction), but that’s not a career I’m talking about right now. This matters for leadership, because it motivates the search for gaps, possibilities, and opportunities in everyday things that we don’t think about too much. Are there seemingly disparate things you can combine to create an innovative solution? Is something sitting right in front of you that’s an answer to your current challenge?